If you're looking to take a voyage down the Hudson River or a sightseeing cruise on one of Upstate New York's lakes, you have many cruise lines to choose from. The companies below offer guided tours, dinner cruises, and can even host your special events in Albany and the Capital Region. Take a cruise with Dutch Apple on the scenic and historic Hudson River, the ideal way to see the sights. 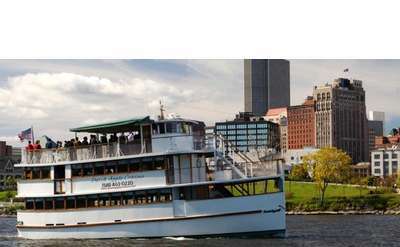 Sightseeing Cruise & private event venue located in Albany, NY. Purchase tickets to any of our cruises on our website! Lake George Steamboat Co., Inc.
Lake George Steamboat Company offers daily cruises, sightseeing trips, and specialty tours aboard its three large ships. Have a wedding or other event coming up? Lake George Steamboat will gladly host it for you! The Captain J.P. II is available for weekly and specialty cruises, plus chartered trips. The four deck cruise ship can accommodate 600 passengers and is perfect for any occasion. Come enjoy a memorable cruise surrounded by the spectacular Adirondacks and the sparkling blue waters just off our shores. Whether aboard the beautiful Horicon or the new Adirondac, you will experience Lake George as it was meant to be seen! Indian Pipes offers personalized tours and specialty events aboard its 36-foot luxury yacht. Cruises are available May - October, and there is an 18 passenger maximum.